The monarch butterfly is a new national priority species of Working Lands for Wildlife (WLFW), a partnership between the U.S. Department of Agriculture’s Natural Resources Conservation Service (NRCS) and the U.S. Fish and Wildlife Service (USFWS). Populations of monarchs, a pollinator species cherished across North America, have declined significantly during the past two decades. This collaboration aims to help the species recover by working with agricultural producers to make wildlife-friendly improvements on their farms, ranches and forests. 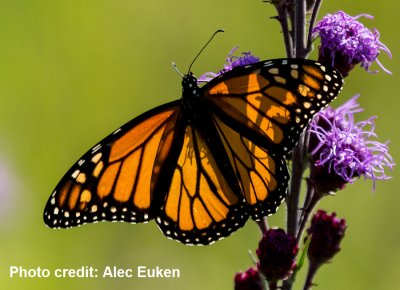 NRCS and USFWS recently completed a conference report that explains how conservation practices can help the eastern monarch population, a species known for its remarkable annual, multi-generational migration between central Mexico and the United States and Canada. This report is an initial step toward adding the monarch to WLFW, which uses a science-based, targeted approach to help a variety of at-risk species. The monarch butterfly joins an array of wildlife species across the country already part of WLFW, including the greater sage-grouse and New England cottontail, two recent successes in species conservation. The USFWS determined in 2015 that the two species didn’t warrant protections under the Endangered Species Act (ESA) because of voluntary conservation efforts underway to restore habitat. Through WLFW, NRCS provides technical and financial assistance to help producers adopt conservation practices that benefit the monarch. Meanwhile, through the conference report, the USFWS provides producers with regulatory predictability should the monarch become listed under the ESA. Predictability provides landowners with peace of mind – no matter the legal status of a species under ESA – that they can keep their working lands working with NRCS conservation systems in place. Work through WLFW centers on 10 states in the Midwest and southern Great Plains that are considered the core of the monarch’s migration route and breeding habitat. Much of this work will focus on planting and enhancing stands of milkweed and other high-value nectar plants for monarchs. Assistance is available to producers in Illinois, Indiana, Iowa, Kansas, Minnesota, Missouri, Ohio, Oklahoma, Texas and Wisconsin. USFWS has committed significant funding – $20 million over five years – to support monarch conservation efforts. Additionally, USFWS is working with partners, including the National Fish and Wildlife Foundation, National Wildlife Federation and the Mexican and Canadian governments to leverage resources and investments to support and implement conservation actions across the continent. During the past two years, NRCS has made available $6 million through a variety of Farm Bill conservation programs for monarch conservation in the 10 states. Additionally, NRCS is working with partners, including The Xerces Society and General Mills, to increase staffing capacity to help producers design customized conservation strategies for working lands. Producers interested in NRCS assistance should contact their local USDA service center to learn more. NRCS accepts landowner enrollment applications on a continuous basis. NRCS offers more than three dozen conservation practices that can provide benefits to monarchs as well as a variety of other pollinators. 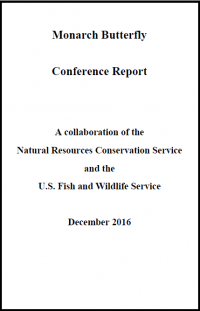 Click the image below to download the Monarch Butterfly Conference Report.